Happy Fall! And what a perfect season it has been! From pumpkin patches to corn mazes to haunted house hayrides, Toni's been out enjoying all that rural Kentucky has to share in this red and gold and cinnamon and apple pie season. It turns out Toni, a cat person if there ever was one, also likes alpacas. Who knew? One more autumn discovery this year. And are they not totally adorable? It hasn't been all fur and games, however. Toni's completed her next novel, and it's not called CORAL COVE anymore! New title: ALL I WANT IS YOU, a Coral Cove Novel. Yep, we're going with a new kind of title! And yes, we're leaving Destiny - but it won't really feel that way. ;) In June, 2014, you'll find some characters you already know, and part of the book is set in Destiny, so Coral Cove will just feel like a home away from home. Toni celebrated her book and her birthday with her annual girls night out- this year a dance party. It was super fun evening full of dance hits from the 80s and a crazy local Cincinnati band, the Naked Karate Girls--who weren't girls, weren't naked, and didn't do any karate! But boy could they play that funky music. Halloween comes shortly after Toni's birthday, so October is a month full of costumes and cupcakes! 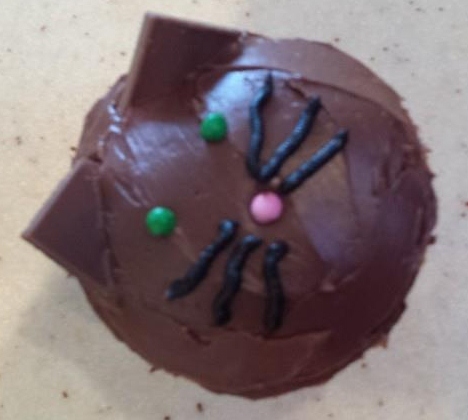 She co-hosts a party with her friend Lindsey each year...and her chocolate kitty cupcakes were gone in a flash. Here are Toni and Lindsey—it was a horns vs. halo type of affair. Spicy and sweet, just like Toni's books! If you want to snag free autographed copies, visit Toni's Facebook page frequently. Thanks to rules changes, she's allowed to give away even more than before, so comment, share and "like" her posts and you might be a winner. She's been so busy, it's hard for Toni to believe that Christmas is right around the corner, along with the long-awaited re-release of her New Orleans set book, WILDEST DREAMS, which comes out on November 26. And a book release means booksignings! Toni will sign at Barnes & Noble in Lexington, Kentucky on Saturday November 30 and at the Barnes & Noble in Westchester, Ohio a week later on December 7. Toni will also be signing her holiday bestseller, HOLLY LANE, and more at these events. Watch www.toniblake.com and Toni’s Facebook page for details. But back to WILDEST DREAMS - isn't that cover gorgeous? In the meantime, if you'd like a taste of fall in Destiny, why not check out Sugar Creek? It's filled with fall leaves, apple orchards and bonfires--and a hunky cop who meets his match in a prodigal hometown girl.